Busy news day for my local airport, Newark Liberty International. Oh, I'm sure there were delays, there always are at EWR, but today we had two "D'oh!" moments. 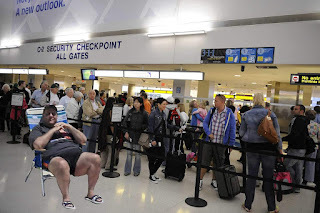 Former Governor Chris "Bridgegate" Christie was allegedly turned away from the special security checkpoint he used when traveling as an official, and sent back to the kind we commoners have to use. He's claiming that that's not exactly what happened. Dunno, seems plausible to me. Either way, doesn't sound like he made a kerfuffle about it. And a television crew filming for CNBC tried to get a fake explosive device (!) through a security checkpoint. A different one, one assumes. I know this is hardly the first journalist team to try smuggling weapons, real or otherwise, through a TSA checkpoint to try to make a point, and others have actually succeeded, but with thousands of dollars in fines and probable jail time if they're charged and convicted, who thought this was a good idea?